Welcome to Bubble Company. 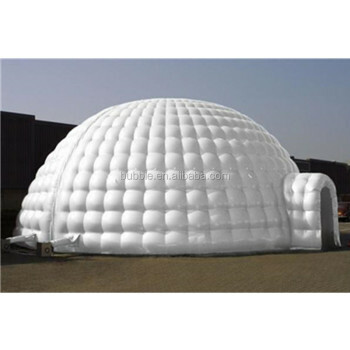 Inflatable Tents are easy to set up and transport, convenient to be used for events, parties, wedding, ceremony, sport arena and business advertising like promotions, grand opening, trade shows, etc. We have many colors and designs for your options. Q: What are Inflatable Tents made of? A: durable PVC tarpaulin or PVC vinyl material, weather-resistant, waterproof, fire-retartant, UV protective, 0.25mm to 1.0mm thickness available. Q: How to inflate an Inflatable Tent? A: Can inflate by an electric blower/pump included. It usually takes 3 to 30 minutes to inflate a tent depending on design. Q: Can we use Inflatable Tent in winds? A: Yes, the tent itself is usually heavy to stand stably, we make D rings and match ropes for you to tie for more stability. You can also use sand bags or water bags to increase stability. However, please use depending on actual scene. Q: Can we use Inflatable Tent in rain? A: Yes but since the blower is connected with electricity (unless grade to Airtight style), we don't suggest long time use under heavy rain although the tent material and blower plastic case are waterproof. A: Yes. May be for free or charged depending on quantity, printing colour and size. You may send us high resolution artwork in JPG, PDF or PSD. Q: What happens if the Tent punctures? A: Due to constant blown air, the tent can still be blown up and use as long as the damage area is not big.The damage can be repaired by sewing machine, and PVC vinyl tents can also simply be repaired by our repair kit (material patches and glue). 2. Material: durable PVC tarpaulin or PVC vinyl material, weather-resistant, waterproof, fire-retartant, UV protective, 0.25mm to 1.0mm thickness available. 5. All these designs are made in constant air blown style with blower working all the time. Some designs can upgrade to Deluxe airtight (sealed) style which needs one time inflation only. 7. Optional accessories: doors, windows, halogen/LED lamp, hook&loop banners, A/C vent, etc. 11. Payment: 30% down payment. By T/T (telegraphic bank transfer), Western Union or Money Gram.